Lower sunvex Parry is a halo of which for long time only one certain report was known: the photograph by Takeshi Ohtake in 1979 in Alaska, shown in Walt Tape's book "Atmospheric Halos". Now the sightings of lower sunvex Parry seem to be increasing. Last winter it was photographed twice in Finland and this winter we have two reports as well. 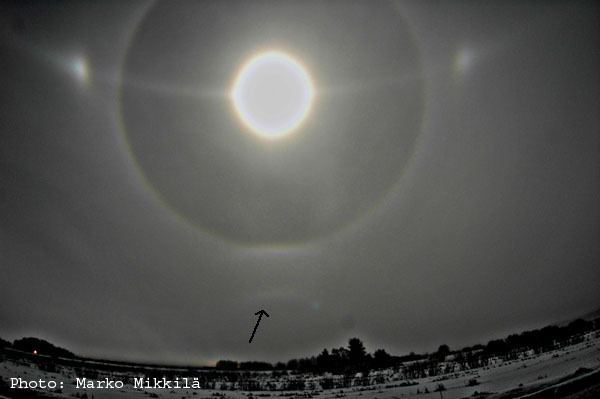 Picture above is the latest sighting of lower sunvex Parry (arrow), by Marko Mikkilä at Sievi on the night of 15/16 January 2006. The display was caused by snow machines from nearby ski resort. Moon elevation is 40°. Winter's first sunvex Parry was seen on 8. January 2006 at Himos ski resort. Photos of the display by Mika Aho are seen here. Simulations with different crystals are here. Mikkilä display had also other rare halos. He reports lower Tape arcs, Wegener arcs, helic arc and subhelic arc. Also interesting halos from car headlights were present. Thats interesting the only parry arcs I have observed were upper suncave/sunvex arcs and lower suncave parry. The only ones I photographed were upper suncave and sunvex parry arcs and recently on Jan 15th heliac arc. Michael, so you got observation of lower suncave? That's rarity.